Below the Contact Information you can view and edit your personal data. You have also the option to change your initial password. Right next to the Contact Information, you can subscribe to our Newsletter and receive interesting news and articles about our product configurator and service portfolio. Below, you can deposit your Payment Data. IMPORTANT: If you decide to purchase our product configurator during the test phase, please deposit your payment data BEFORE the test version runs out. Otherwise, you will be not able to enter your account and the configurator again. Accepted payment options are credit cards or the direct debit procedure. 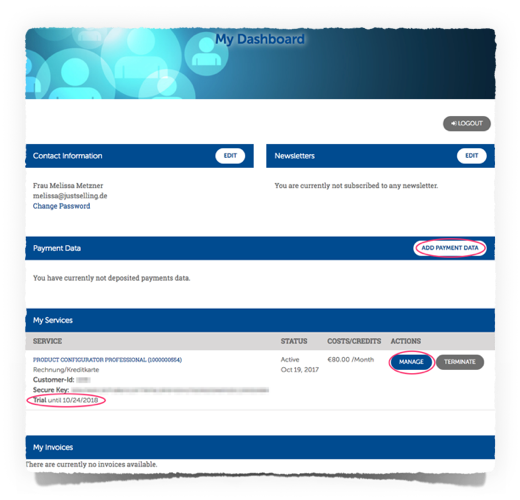 In case payment information is already deposited when the trial expires, the cloud service will be activated accordingly. You can check under My Services => „trial until…“ how long your trial version is available. Here you can also find your personal customer data. With the Customer ID and Secure Key the software can verify you as a user. If If you haven’t chosen any other version of the configurator, you automatically work with the PROFESSIONAL-version in your trial phase. If desired, the version can be changed later in the configurator. Under www.product-configurator.com/rates-and-prices you can inform yourself which version of the product configurator fits best to your business. My Services shows the last day you were active in your account and your current credit (only the test version is booked yet, which is for free!). By clicking on „Manage“ you get directly to the product configurator interface. If you want to end the test phase and delete your account, just click on „Terminate“. In case our product configurator has convinced you (we assume it will…) and you have subscribed for it, you can check your monthly bills comfortably under My Invoices. Please give us a feedback! Does this article help you? If not, please do not hesitate to contact us personally via chat (blue chat button, lower right corner).